Last year I picked up a couple of golden (or yellow) beets kind of on a whim while grocery shopping. I’d never cooked beets before, I liked pickled red beets, but hadn’t even heard of yellow ones. I think I was hoping they’d be a little less messy than their dark red, juicy cousins. I roasted them with a head of cauliflower, onion, and garlic and absolutely fell in love. When roasted, golden beets are sweet and tender and don’t have ANY of the juice and staining problems that red beets do. Since then, I have added these to a number of dishes because I love how bright they are and how delicious. 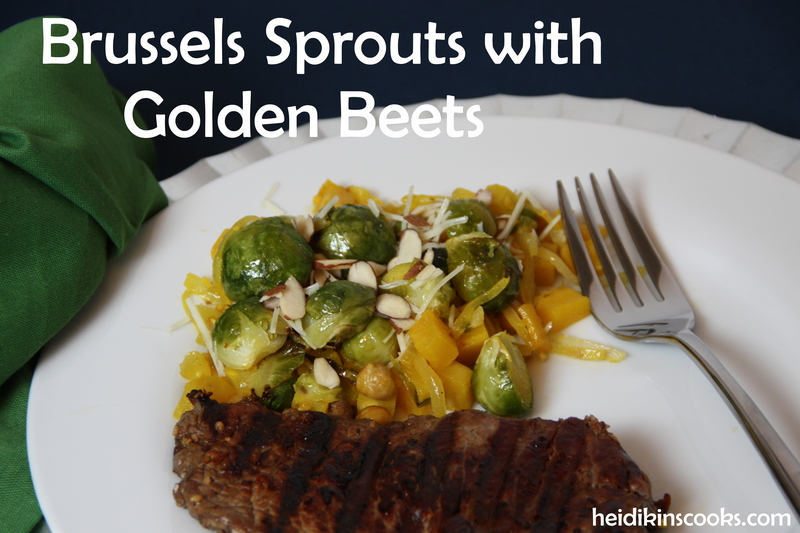 Tossing sweet golden beets with Brussels Sprouts, onion, garlic, and the last of the chickpeas and roasting the whole thing for a half hour resulted in this wonderful mix of flavors and textures. I topped it with a bit of Parmesan and some chopped up almonds and devoured the whole thing immediately. This would be an excellent side dish with any kind of grilled or roasted meat, mashed potatoes, soup and bread, or whatever you fancy! Wash and trim the Brussels Sprouts, cut in halves, and toss onto a rimmed baking sheet. Carefully slice the outer peel off the beets, trim, and then cut into thickish slices (1/2 inch), and then into cubes, place on baking sheet. Chop up your onion and garlic, add that to the baking sheet with the chickpeas. Drizzle the whole mess with olive oil, push it around with a spatula until everything is coated, sprinkle generously with salt and pepper, dry mustard, and a few shakes of red pepper flakes. Toss into your preheated oven for 30-45 minutes, until your beets are soft and before the sprouts start to char, you will probably want to stir things around every 10 minutes or so. Give yourself a generous helping, check for salt, then top with Parmesan and sliced almonds.